COLUMBUS, GA (WTVM) - A simple invention is the brainchild of a Georgia man who saw firsthand, both parents and children struggling to move inside the halls and rooms of hospitals. Now, this special toy has a new home and purpose among the youngest patients receiving treatment at Piedmont Columbus Regional hospitals. "[It was] such a hassle, just dragging the I.V. pole plus the wagon," said nursing specialist Kelsey Walker. "Now, we have it all together." The wagons were donated by Roger Leggett, an inventor from Douglasville who attached a custom bracket and pole on several red Radio Flyer wagons. The toys, sporting "Chad's Bracket," are already being put to good use by patients like four-year-old Zach, and by staff like Walker at the Children's Hospital. "When I saw them," she said, "I was extra excited and so was our staff." Leggett got the idea for the bracket in 2011 while visiting his four-year-old granddaughter as she received treatment for a brain tumor. The brackets are named after Leggett's son Chad, who tragically died just weeks after helping him design the device. The story is touching the hearts of Walker and the Children's Hospital staff. "Just hearing his story was really inspirational," Walker said. "We're very thankful that he wanted to donate to our hospital." 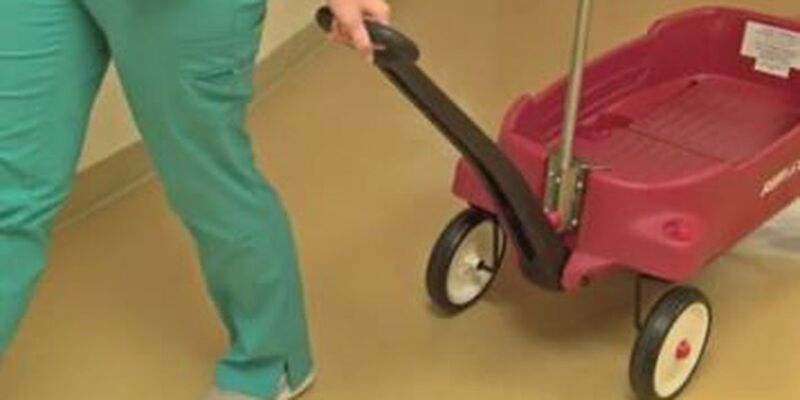 Walker now believes these new red wagons, equipped with "Chad's Brackets," will work miracles for the children and families. The Chad's Bracket foundation has already donated several wagons with the special poles across Georgia. Piedmont Columbus Regional said they're working with the charity to attach more custom I.V. poles for kids to enjoy while at the hospital.